LAOAG CITY — Romaine Organics, a certified organic farming company in Batac City, is opening its farm to the public once again for another first in the region – the “Pick and Pay” promo. Under the offer, customers are allowed to go around the farm, pick locally-grown lettuce themselves, and pay for their harvest. Romaine Organics is owned by the Ganiron family, whose farm is located in Barangay Ben-agan, Batac City. The company is being run by John Lei and his father Romeo, both multi-awarded farmer-entrepreneurs in the locality. According to John Lei, who is farm management supervisor of Romaine Organics, the price of their organic and hydroponic lettuce is currently pegged at PHP250 per kg. Adjacent to their residence in Ben-agan village is a showcase of auto-switched hydroponic lettuce that can be harvested at the Ganirons’ 10-meter by 8-meter greenhouse. 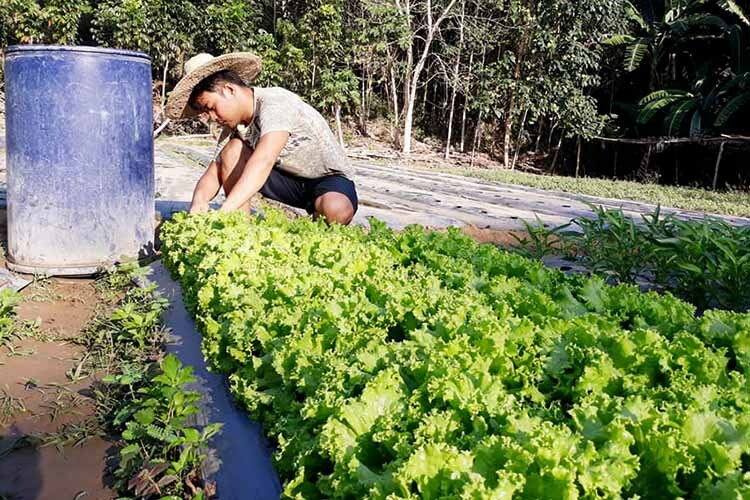 The family also owns a three-hectare integrated farm lot and farmer’s school, the Romaine Organics School for Practical Agriculture, located in Barangay San Mateo, a 10-minute drive from the city proper. John Lei said most of their customers are owners of restaurants in Laoag and nearby towns while some are neighbors who enjoy picking their fresh salad ingredient directly from Romaine Organics. Aside from lettuce, the farm also produces micro greens and other high-value crops, such as Chinese kangkong, eggplant, okra, bottle gourd, squash, pole sitaw, bell pepper, finger pepper, tomatoes, cucumber, banana, dragon fruit, and carabao mango. Romaine Organics is also engaged in poultry and native hog production, and the culture of inland fish, such as tilapia and hito, and maintains a nursery for high-value crops seedlings. The Ganirons are likewise producing mushrooms, azolla, duck weed, herbal insecticide, and organic fertilizers through vermicomposting, fermented juices, and bio-sprays and concoctions. Meanwhile, Romaine Organics School for Practical Agriculture is accepting students who want to learn about organic farming, with the help of the Agriculture Training Institute, Batac’s local government, Department of Agriculture, and other support organizations. It is open to interested farmers or agriculture students 18 years old and above. The training is free. The farm school is the first Technical Education and Skills Development Authority-accredited facility of its kind in Ilocos Norte and offers a 29-day training course.